PlanetReuse's network allows those that want to incorporate reused materials on their project to rely on a central set of tools. Simply fill out our Material Request form to tell us what type of materials you're looking for and we'll connect you to options locally or nationally, based off your timeline and project goals. LEED and LBC projects will benefit from our extensive database of materials and partners to meet your projects certification standards. Excess New CFL Lightolier Fixtures - 50% less than the price of new. Canceled project with single and dual-lamp fixtures still in original boxes available immediately. There are 350 of each type - excellent opportunity to save money! To check out the latest flyer, click here. Don't see what you are looking for? Just let us know what you are looking for and we'll find it for you. Want to join our newsletter so you receive updates as they are sent out? Register for our newsletter and flyers here. With our Deconstruction Consultation Service, we help municipalities, building owners, demolition and general contractors to evaluate materials that can be reclaimed, reused and recycled for commercial and municipal projects. PlanetReuse can generate the necessary UL Certification, Structural Engineering Reviews, LEED Innovation Point Potential and other documentation required to resell building materials. We fully inventory all reusable materials, with documentation, photographs and other information in our searchable database, made available for architects and designers online. 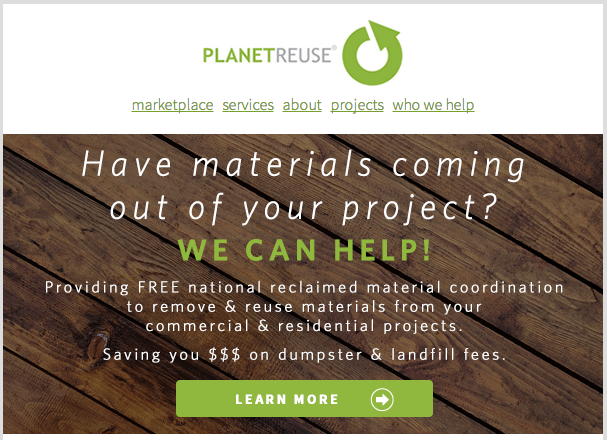 Contact us at info @ planetreuse.com or join us at PlanetReuse.com to learn more about our online tools to help you locate, source and resell reclaimed commercial and residential building material. PlanetReuse 2.5 goes live tonight at midnight! We've taken your feedback and comments from other sustainably-minded designers and architects to introduced two new tools into the PlanetReuse online engine to help the end user find and source reclaimed and underutilized material for green building. Our Material Brokering Services help architects and designers incorporate reused materials into their commercial and residential projects. With the relationships we have in place with our partners, PlanetReuse can help locate materials unavailable on the website to help complete your project. With the Request Materials form, you can place free requests on PlanetReuse to reduce the amount of legwork needed to find reused building material for LEED MR credits. We'll help connect you through our brokering services by sending samples to your doorstep. You can also View Material Requests other users have submitted online to help you grow your business and help divert construction material from landfill. Although we're taking down our online Shop temporarily, we're introducing a tool to allow users to enter available materials they have and want to move through our material brokering services. Stay tuned for an update or simply visit http://www.planetreuse.com on November 12th to see the next evolution of PlanetReuse, connecting contractors, homeowners, architects, designers, architectural reclamation stores, and deconstruction professionals together for a bigger, better online sustainable tool.